Amiel (25.11.2014) - Season's Greetings from the Holy Land. Machine 001. Mint ATM, domestic postage (NIS 1.80). Amiel (25.11.2014) - Season's Greetings from the Holy Land. Machine 001. 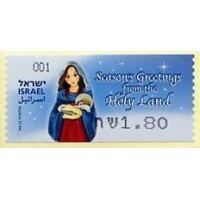 Pictorial first day cover, domestic postage (NIS 1.80). Amiel (25.11.2014) - Season's Greetings from the Holy Land. Machine 001. First day cover, mailed to Spain (NIS 3.80). Amiel (25.11.2014) - Season's Greetings from the Holy Land. Machine 001. Mint set 4 values (NIS 1.80 - 3.20 - 3.80 - 5.60). Amiel (25.11.2014) - Season's Greetings from the Holy Land. Machine 001. Mint button set 8 values (NIS 1.80-2.70-3.20-3.80-4.00-5.10-5.50-5.60). Amiel (25.11.2014) - Season's Greetings from the Holy Land. Machine 015. Mint ATM, domestic postage (NIS 1.80). Amiel (25.11.2014) - Season's Greetings from the Holy Land. Machine 015. Mint set 4 values (NIS 1.80 - 3.20 - 3.80 - 5.60). Amiel (25.11.2014) - Season's Greetings from the Holy Land. Machine 015. Mint button set 8 values (NIS 1.80-2.70-3.20-3.80-4.00-5.10-5.50-5.60). Amiel (25.11.2014) - Season's Greetings from the Holy Land. Machine 020. Mint ATM, domestic postage (NIS 1.80). Amiel (25.11.2014) - Season's Greetings from the Holy Land. Machine 020. Mint set 4 values (NIS 1.80 - 3.20 - 3.80 - 5.60). Amiel (25.11.2014) - Season's Greetings from the Holy Land. Machine 020. Mint button set 8 values (NIS 1.80-2.70-3.20-3.80-4.00-5.10-5.50-5.60).